Everyone has their little foibles, right? Well, apparently I’m addicted to tabards. Some time before TBC was released, I realised I had almost every tabard in the game (available to my faction, obviously). What a worthy goal it would be to fill out that collection, I thought. 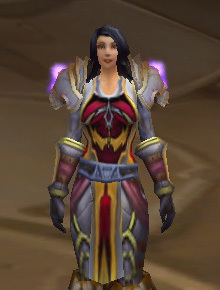 Left: Tabard of the Argent Dawn, awarded during the Scourge Invasion when Naxxramas was introduced in patch 1.11. 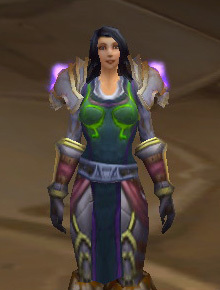 Right: Tabard of the Protector, awarded during the opening of the Dark Portal at the launch of The Burning Crusade. 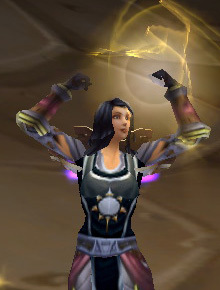 As you can see, they’re identical, except that the Tabard of the Protector has a Use: effect on a 5-minute cooldown that looks like a Holy Nova. Neither tabard is available now. Left: Private’s Tabard, purchasable under the old honor system at Private rank, or now for 3 AB Marks of Honor and 3 WSG Marks of Honor. Centre: Knight’s Colors, purchasable under the old honor system at Knight rank, or now for 20 AV Marks, 20 AB Marks and 20 WSG Marks. 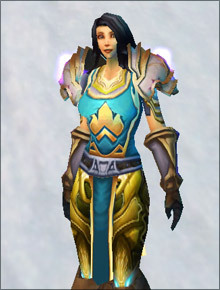 Right: Stormpike Battle Tabard, previously purchasable at Exalted Stormpike reputation (the Alliance faction in Alteract Valley), now purchasable with 60 AV Marks of Honor. Left: Tabard of Frost, purchasable from Upper Deck Entertainment with points obtained from buying packs of the WoW Trading Card Game. 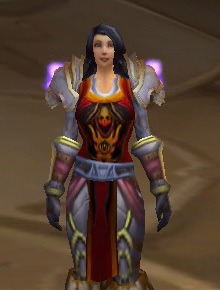 Right: Tabard of Flame, obtained via a rare “loot card” in the WoW Trading Card Game. In both cases you get a special code from UDE, the publisher of the game. You redeem the code and get an in-game code, which you take to Landro Longshot (a goblin in Booty Bay); he gives you your reward. Left: Green Trophy Tabard of the Illidari, a quest reward from Battle of the Crimson Watch (a fun group quest in Shadowmoon Valley). Right: Tabard of the Scarlet Crusade, a random drop off Scarlet Trainees in Scarlet Monastery, the non-elite who run in to be AoEd to death after you kill Herod in the Armory wing. Cenarion Expedition Tabard, Consortium Tabard, and Honor Hold Tabard respectively: all attainable at Exalted with the relevant faction. 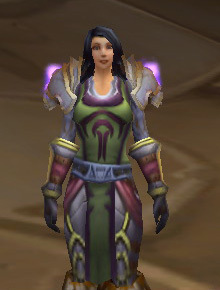 Kurenai Tabard, Lower City Tabard, and Ogri’la Tabard respectively: all attainable at Exalted with the relevant faction. Scryers Tabard and Sha’tar Tabard respectively: both attainable at Exalted with the relevant faction. Skyguard Tabard and Sporeggar Tabard respectively: both attainable at Exalted with the relevant faction. 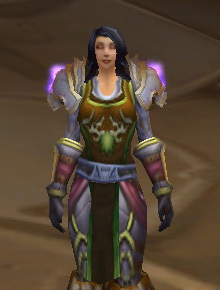 Left: Keepers of Time Tabard, attainable at Exalted with Keepers of Time. Center: Tabard of Summer Skies, a reward from this quest to kill Lord Ahune, a seasonal boss during the Midsummer Fire Festival. Right: Competitor’s Tabard, a reward for competing in a Battleground during the 2008 Beijing Olympics. 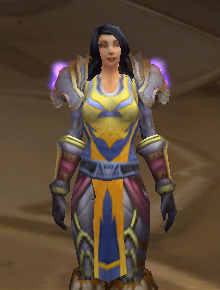 Arathor Battle Tabard: requires Exalted with the Alliance AB faction. Such a grind. Ugh. 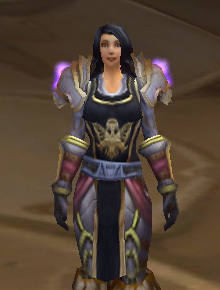 Silverwing Battle Tabard: requires 60 WSG Honor tokens. I just haven’t got around to this one yet. 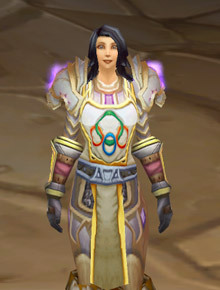 Tabard of Brilliance (white), Tabard of Fury (yellow), Tabard of Nature (green), Tabard of the Arcane (purple), Tabard of the Defender (orange), and Tabard of the Void (black). All are purchased using UDE points from the WoW card game. They have the same design as the Tabards of Flame and Frost (above), just in different colours. 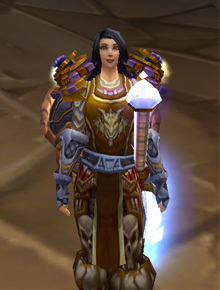 Tthey’re being implemented in stages; as of September 08, the Tabards of Brilliance and the Defender aren’t in-game yet. Purple Trophy Tabard of the Illidari: One of two random quest rewards, the other being the Green variant listed above. You can only get one of the two, so I can never get this. Tabard of Summer Flames: One of two rewards from a one-off quest during the Midsummer Fire Festival. You can only choose one tabard each year, so I have to wait til next year for this. Aldor Tabard: I’m a Scryer, so I can’t get the Aldor tabard without doing a very long handin grind to abandon my Scryer standing. I already did that once in reverse, from Revered Aldor (for Jewelcrafting recipes) to Exalted Scryers (for Jewelcrafting recipes and the shoulder enchants). Tabard of Stormwind: Not in game yet. Tabard of the Hand: a Draenei-only tabard; part of the quest reward from the final quest on Bloodmyst Isle, which is not available to non-Draenei. Blood Knight Tabard: part of the reward for the level 60 epic mount quest for blood elf paladins. Obviously, I am not a blood elf, so no dice. Any of the seven Horde-specific factional tabards (Defilers [AB], Warsong [WSG], Frostwolf [AV], Mag’har [equivalent of Kurenai], Thrallmar [equivalent of Honor Hold], Scout [equivalent of Private], and Stone Guard [equivalent of Knight]). Hi I am new at “replying” to blog articles but I am getting ready to start blogging myself. 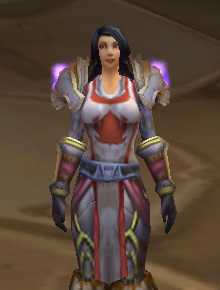 I am a Holy Priest on Argent Dawn US…my toon is Crusard. I am partial to Healer websites of any class. Theer are many good ones out there and I just wanted to let you know that I really appreciate the information that you provide on you WoW experiences. I hope you keep it going and I look forward to reading future posts. I have exalted Reps myself that offer a tabard as a reward but I never saw the utility of buying them for vanity purposes but I think you have peeked my interest. Some of those tabards actually look quite nice. If you armory me I am currently respeccing 2 times week so I am never in my raiding gear till the weekend. My DPS gear is pretty lame I’m afraid. Take it easy! Hey, glad you’re enjoying the blog! There are a lot of good priest blogs around, too; some of the standouts are Egotistical Priest, Priestly Endeavors and Musings of a Holy Hybrid. That is an awesome collection, I still have the scarlet monestary tucked away in my bank somewhere, I’m impressed. Nice blog by the way too. It was one of those collections that just kinda started by accident… and then once I started I couldn’t stop. The rep requirement for WSG Tabard has been removed ever since the revamped Honor system. You can pick it up for.. I think 60 WSG Marks, no rep required. @MK: Since it’s not soulbound. my guild tabard is actually on a banker alt. I just don’t have room for it in my bank bags! …the curse of being a hybrid. Oh wow, I’m super impressed. Awesome collection idea too! I myself have this pipe dream to become exalted with the three battlegrounds factions and get the “Justicar” title, but considering I’m just barely friendly with AB and WSG, I dunno if this is ever gonna become a reality. @Megan – Ooooh. I’ll have to check on the Arathi one as well – I really, really hope they did the same thing. Fingers crossed. @Witch Doctor – why thankyou. The Sporeggar tabard amuses me very much – much love for the little mushroom people! Geeze, Siha. How do you have the bank space? Okay, sure, I’ve only dished out enough to get three extra bag spots in the bank on both of my seventies, but… well. Space is ridiculously hard to find still. My friend has all of his bank slots bought (I’m not that rich) and has a small collection himself. I almost envy him. Almost. I’ve bought all seven bank slots, and I’ve got 6x 20 slot bags in there (the last one’s an 18-slotter), and my four inventory bags are all 20-slotters as well. At that, I have zero space free in the bank, and only ~12 slots free in my bags. Oh, wow. Huge kudos to you! It’s a really nifty collection, that much is for sure. …And I thought -I- had bank/bag issues… at least I don’t have a collecting streak. That is a whole lot of tabards you have collected there. I don’t know how you make room in your bank bags either. Wow, that is really impressive. I’ve only got about 5 tabards myself. I’m much more of a pet collector (51!). I would really like to see Blizz change the tabards to spells like they did with mounts and pets. That would definitely make it easier to handle a large collection.